Barangay Ginebra will be looking to retake the series lead tonight when they face the San Miguel Beermen. Ginebra defeated San Miguel, 127-99, in Game 1 led by Justin Brownlee’s 42 points. The Beermen responded in Game 2 by routing the Gin Kings, 134-109, led by Alex Cabagnot’s 33 points. 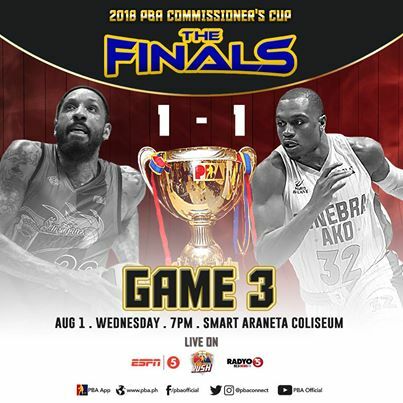 Here are the details for Ginebra vs. San Miguel in Game 3 of their finals series. Best Player: Chris Ross - 23 points (7/13 3FGs), 7 rebounds and 5 assists. SAN MIGUEL 132 - Balkman 28, Ross 23 (7/13 3pts), Fajardo 22, Lassiter 12, Standhardinger 12, Santos 11, Cabagnot 9, Nabong 6, Pessumal 5, Heruela 4, Lanete 0, Ganuelas-Rosser 0. GINEBRA 94 - Brownlee 32, Caguioa 12, Slaughter 9, Devance 7, Mercado 7, Tenorio 5, Ferrer 5, Mariano 5, Chan 5, J. Aguilar 4, Thompson 3, Caperal 0, Manuel 0.